Anyone who has experienced a hive or rash from penicillin, wheezing from aspirin, or a swelling of the tongue from Tegretol (carbamazepine) knows full well what drug allergies are--and just how unpleasant they can be. 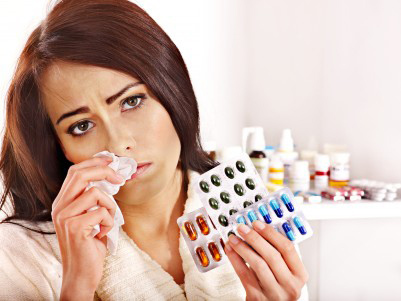 Drug allergies are a group of symptoms caused by an allergic reaction to a medication. Not every adverse reaction to a drug, however, is a drug allergy. Adverse, or negative, reactions to drugs can, according to the World Allergy Organization, be divided into predictable reactions (pharmacologic actions of the drug in an otherwise 'normal' person) and unpredictable reactions (related to an individual's immune response in susceptible patients). A drug allergy is a type of unpredictable reaction, and is much less common than other adverse reactions. In fact, the Organization notes, that adverse drug reactions account for 3-6% of all hospital admissions, but drug allergies comprise fewer than 10% of all adverse reactions. More minor reactions such as a mild rash, which often responds quickly to an over-the-counter antihistamine, such as Benadryl. Serious reactions. Some of these reactions include rashes, hives, swelling, hostness of breath, dizziness. Such reactions may require oral or injected corticosteroid. Seek emergency treatment if you have any of these symptoms. Anaphylaxis can become a life and death situation that requires an immediate injection of epinephrine, followed by a quick ride in an ambulance for hospital care to maintain blood pressure and support breathing. If you've already had a serious allergic drug reaction, ask your doctor whether you need to carry an epinephrine injection (EpiPen, EpiPen Jr, Twinject). PubMed Health explains the allergic reaction process, which can begin at any point in your taking the drug. You might have no reaction the first time you take the medication. All is not well, though. If your body's immune system isn't happy with the intruder, it produces an antibody called immunoglobulin E (IgE). 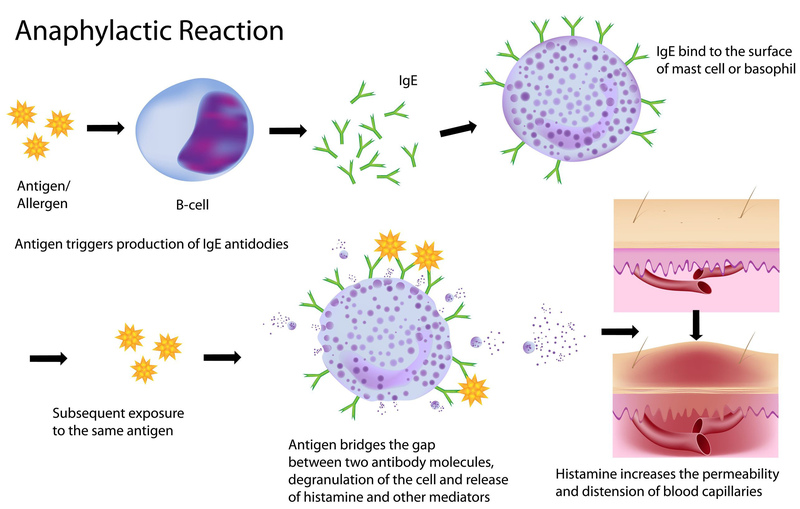 The next time you take the same medication, the IgE orders your white blood cells to create a chemical called histamine, which is what causes allergic symptoms. Anaphylaxis involves the entire body. Tissues all over the system release histamine, causing a number of symptoms, ranging from, most commonly, a tightening of the airways, to abdominal pain, difficulty swallowing, nausea and vomiting, swelling of the eyes, face and tongue, heart palpitations, and loss of consciousness. A drug allergy differs from a drug intolerance. A drug intolerance, or an adverse side effect from a drug, doesn't involve the immune system at all. A common drug intolerance is stomach upset. As opposed to an allergic situation, however, you may be able to continue taking your medication if you have a drug intolerance. Sometimes taking the medicine with food or taking a lower dose alleviates the symptom. Often a drug intolerance will dissipate as you continue to take your medication. Painkillers like codeine or morphine, nonsteroidal antiinflammatory drugs (NSAIDs), like ibuprofen, and even aspirin. Antibiotics such as penicillin, sulfa drugs, and tetracycline. Anaphylaxis, which is life-threatening (see above). The World Allergy Organization notes that risk factors for a drug allergy include both drug factors and host factors. 'cross-sensitization,' meaning that once a reaction to a certain drug has taken place, the likelihood of a reaction to drugs with similar chemical structures increases. 4)previous drugexposure (those who have been allergic to drugs in the past may have a greater likelihood of developing allergies to newdrugs). Mayo Clinic adds that a history of other allergies, even hay fever, increases your likelihood of an allergic reaction, as does taking several drugs at the same time. Additionally, those with asthma, heart disease and high blood pressure are at a greater risk for developing a more severe reaction. Drug allergy treatment's goal is to alleviate the symptoms and prevent a severe reaction. Epinephrine (also known as adrenalin) by injection to treat anaphylaxis. Although there's nothing you can do to prevent an allergic reaction from occuring the first time. There are some sensible, helpful steps you can take protect yourself. Clearly, your best bet is to avoid both the known allergen, and, most likely, similar medications (those allergic to penicillin should avoid amoxicillin, as well). You should wear a medical alert ID bracelet in case you're in an accident, so emergency health providers will know about the allergy. Those who have severe allergic reactions may also want to carry about portable epinephrine injections (such as the EpiPen). PubMed Health notes that at times a doctor might utilize a drug that causes allergy if she first treats the patient with corticosteroids and antihistamines. This pretreatment regimen has been effective in preventing anaphylaxis in people who get x-ray contrast dye. Alternatively, the healthcare professional might utilize 'desensititization,' which involves giving small doses of the medicine tot eh patient over a specified time period. This must be done under a health care provider's supervision. Even if you've told the hospital and health care providers about your allergies, keep on the alert. Your safety may be in your hands.